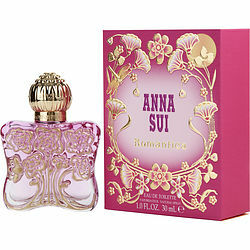 Anna Sui Romantica smells really good its very soft.. smells like flowers but not strong at all.. it's not over powering... very good for a date night or just a girls night out to have dinner & a couple of drinks... or a if u work in an office setting very good for that as well I wish I could describe the under tones but it's very flattering good for teen girls & grown women... I'm 35 & I love it I would use it as an everyday perfume for work... wish I would've got the 2.5 instead of the 1oz bottle... I think I'm addicted to perfume bc I can't leave without any I even have about 4 different bottles of different kinds of perfume in my car just in case I'm in a rush & I forget to spray before leaving the house... I actually find my Anna Sui 1oz at my local Burlington's for 9.99 & it came with a lil round purse wristlet that I use to keep my everyday touch up makeup in... I am about to order the 2.5oz now.. #GreatBuy #SoftSmell #VeryPleasingToOnesNoes & it doesn't irritate my allergies..